This is the first of three modules that will addresses the second area of statistical inference, which is hypothesis testing, in which a specific statement or hypothesis is generated about a population parameter, and sample statistics are used to assess the likelihood that the hypothesis is true. The hypothesis is based on available information and the investigator's belief about the population parameters. 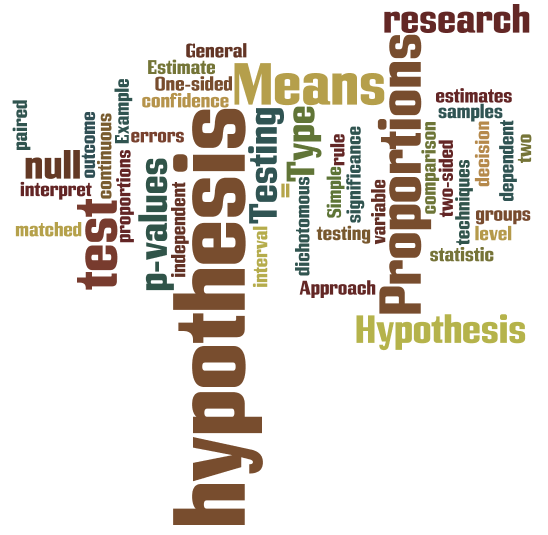 The process of hypothesis testing involves setting up two competing hypotheses, the null hypothesis and the alternate hypothesis . One selects a random sample (or multiple samples when there are more comparison groups), computes summary statistics and then assesses the likelihood that the sample data support the research or alternative hypothesis. Similar to estimation, the process of hypothesis testing is based on probability theory and the Central Limit Theorem. This module will focus on hypothesis testing for means and proportions. The next two modules in this series will address analysis of variance and chi-squared tests.